In a past life, dance took almost all my after school evenings. The school dance company I was involved with practiced for shows and performances all around South America. Bolivian Folkloric dance was a very big part of my life, and having danced for about eight years made me very familiar with the stage and the spotlight. But that was a long time ago and I never intended to enter the spotlight again. A few weeks ago, I caught wind of the auditions happening for two new theatre pieces and I thought it would make an interesting story to follow. I wrote the story with the intention to inform students on how to get involved in the new and thrilling productions that are being developed, but little did I know how deep my involvement would get. I spoke with Oklahoma City Community College Theatre Professor Brent Noel a couple of weeks ago about the upcoming auditions and got the ‘okay’ to attend to talk to students and take photos for the story. I let him know what the arts meant to me, I want to write interesting and compelling stories showcasing college productions and the work students are putting in. 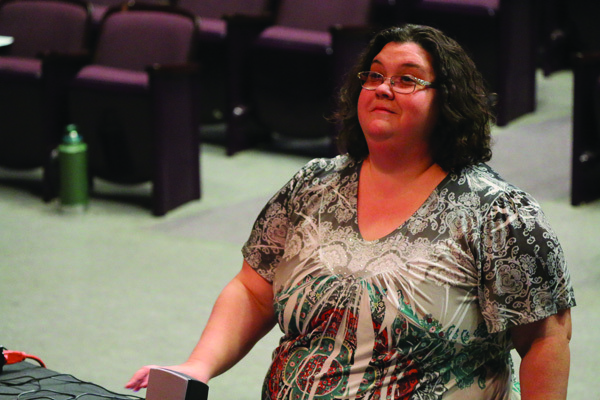 As I entered the theater, memories rushed back to me once I talked to University of Science and Arts of Oklahoma Theatre Arts Professor Katie Davis who was prepping the exercises for the students on stage. I said hello to Brent and Katie. I told Katie how I was excited to get started. I still smile when I think about what she said next. “If you want to cover this, you have to audition,” she said. The room stared for a brief moment to wonder what my response would be. “Sure,” I said with hesitation. I accepted Katie’s challenge. I mean that in the best way possible. I’m sort of a shy kid and I know that there are people much more qualified to perform in a way directors can be proud of. There is a very different type of rhythm that goes into acting. However, as a guy who had no ties to the people and culture of theatre here at OCCC, I felt out of place. I walked five rows behind the crowd to set my backpack and camera bag down to prepare for the pictures I needed for my story. I was excited, nervous, and scared, all at the same time. There’s probably a word in German or Japanese for how I was feeling at the time. Davis told everyone to take the stage and make a giant circle to start the audition. I felt like I was on autopilot. I just put the “I’m a journalist and I’m here to work” mask on and it helped me ease into talking about why I was auditioning. I got through the exercises and drills easily enough. There were more spontaneous games, for example “This is Not a Bottle”, where I wanted to sit back and study the actions and gestures of the rest to understand how I could be more like them. USAO Theatre student Austin Artus took the bottle with confidence and held it against his face. He gazed through the bottle with one eye and people clapped with small whispers that said, “telescope”. 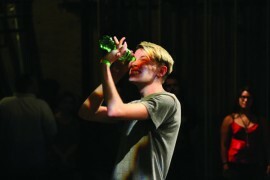 He set the bottle near his feet and bowed in all directions before running back to his spot in the circle. I saw a pattern in the characteristics of a lot of the students who did well in the exercises. They seemed more open, more outgoing, and clearly had more experience than I.
I remember speaking to OCCC Theatre major Kala Anderson. She had this look when talking about her past work. With several roles in several productions under her belt, it was clear that she had a knack for acting. I concentrated on getting good photos for the story and soon discovered that I was genuinely enjoying the moment. One of the tougher exercises was saying something heartbreaking or something heartwarming. What affects you in such a deep emotional level says quite a bit, without saying much at all. When it came my turn to speak I knew exactly what I wanted to say. I guess I opened up a bit. Once the audition wrapped up, the next step was heading to Chickasha on August 25 for the second round of auditions. I’ve never been to USAO or even Chickasha, so it was a bit of a trip. Settling down and seeing familiar faces was nice, even though I knew none of their names. Theatre people have a way of being extra friendly which helped get conversations going. I never planned on showing up to the callback. I never planned on being so invested in a group of strangers and an art medium I’d only ever witnessed from afar. This was happening. A few games and exercises in, there was one exercise that called for everyone to get in a semicircle facing the audience seats. Katie called for six people, including myself, to get in the center and dance alone. Thank goodness my dance years came back. I held my imaginary partner in classic ballroom pose and just went for it. People stood and thought of what to do while I took my strides through them. Being outgoing didn’t seem so bad now. I studied the approach that the rest took when it came time to recite a monologue that was assigned by Katie in the first audition. Inspired by “Cyrano”, where his love falls for another, we had to imagine what he would say or do if he came back after the events of the play in a minutes length. I remember being enamoured with USAO Theatre major Kylie Yount and her speech. She took the monologue to dark places full of regret and emotion for a love that was never there. I took a couple of pictures and was moved to just set my camera down to listen to the rest of her story. I imagine it being hard to understand the look or feel of vulnerability and grief, but Kylie spoke with such ease for what seemed like someone on the verge of tears, it made everything seem organic and intimate. Applause rang through the theatre. The audition was over in what felt like a heartbeat. Katie Davis said the cast list was going up the next day and apologized for not having room for everyone in her vision of “Cyrano”. Brent Noel congratulated all of us and wished us well to see if we could be part of “The Cop in the Head”. Getting cast to have a part in “The Cop in the Head” was never something I expected. It seemed like such a farfetched goal, I didn’t even realise the possibility. The first rehearsal came days later. Some of those familiar faces came back to create a diverse and well rounded cast. Being included was just the cherry on top. We went through “Columbian Hypnosis” just to get warmed up. It’s described pretty well in the first story I wrote, but to sum things up there’s a “leader” and a “follower”. The leader puts one hand about six inches away from the followers face, and it’s the follower’s job to keep that distance at all times no matter how crazy the leader’s hand moves. After some basic games, we got to the formal introductions to get to know each other a bit better. “Say your name, where you’re from, and something interesting about yourself,” Brent Noel said to the group after instructing everyone to sit down in a circle. What followed was almost a therapeutic session of just talking. I dealt with culture shock and major homesickness when I moved to Oklahoma from Bolivia when I was fifteen after living there for ten years. I had to find it in myself to call this place full of strangers “home”, but it was nothing compared to the stories I heard from my fellow cast members. I got to know people who have gone through multiple tours to the middle-east, deal with bipolar disorder on a day-to-day basis, live with a pacemaker to stay alive, and have even gone through brain surgery while losing all memory of grade 3 through 8. It was an experience to say the least. That was day one. I didn’t know what I was getting myself into when I took the student auditions story, but there is something special to look forward to in the production that will be assembled here at OCCC from what I can tell. I will be playing a role in the upcoming production of “The Cop in the Head” that premieres at the Bruce Owen Theater October 6-8. 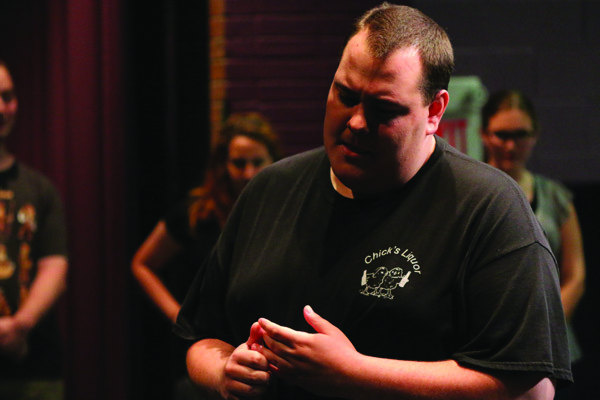 “Cyrano de Bergerac” will premiere at USAO November 10-12 and at OCCC November 17-19.